Note: Parts listed may not be fully compatible with this system. Please refer to the specs given below for parts selection and quantity limitations. If you have any questions, please contact our sales and support team at 1-408-988-9888. AS-JB316 JBOD 3U storage box. Just connect this box to your existing computer (SAS port), you can have up to 32TB storage space. Simple and inexpensive. 1 of SAS x4 external connector (SFF-8088) for host interface. You may connect several such JBODs to SAS controllers installed in your host machine. RAID function shall be set from the SAS controllers in your host machine. 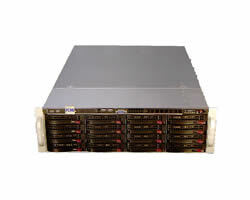 SAS expander backplane supported for 16 SAS or SATA hard disk drives. 16 Hot-swap 3.5" hard disk bays. Transfer rate per hard drive: 3gb. Supports 3Gb SAS or SATA2 enterprise hard drives. To add a 700W power module for fully redundant hot-swap function (option). **Internal and External SAS (SFF-8088) cables included. ***Hard disk drives not included.